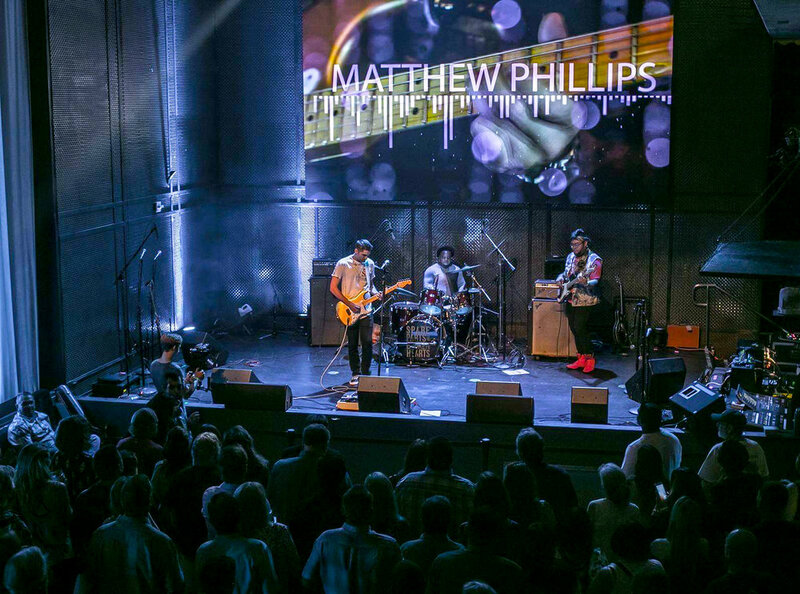 Up-and-coming singer-songwriter Matthew Phillips has been making waves through San Diego’s music scene with over 100,000 followers on Instagram and receiving endorsements from Fender Electric Guitars, Taylor Acoustic Guitars, GHS Strings, and Voss Water, just to name a few. His first debut record is set to release later in the year, but you should check out his live shows! Matthew is known for his personable audience interaction whether it be jumping off stage into a crowd or reaching out to a few lucky audience members during his songs. His music is on par with the likes of the Goo Goo Dolls and Lifehouse, who Matthew cites as his main musical influences. You write wholeheartedly about your good and bad experiences. Can you tell us more about your songwriting process? Matthew: My process has always been that I can never just sit down and be like, “I’m going to write a song.” It has to come from something that I have experienced. I wrote “Together Forever” about a high school sweetheart. We were so in love that we just wanted to run away together. This song will most likely be the first single off the upcoming record due to be released late 2018, early 2019. “Just Say Yes” is about a girl that I fell in love with in high school. I thought she was the perfect girl. I tried to ask her out and I got friend zoned, so I decided to write a song about it. When I’m performing my songs, I’m rehashing out those experiences and all that emotion. I believe it’s that personal connection that makes music so great. It’s much different covering other artists’ music, having to interpret someone else’s feelings. Where did your love for music begin? Matthew: My grandma was a concert pianist. I don’t know the story personally but I’ve been told it happened when I was like 4 or 5; I was not like every other kid. I would sit at the piano and try to figure out melodies instead of just pounding on the keys. My grandma noticed that right away and suggested that my parents put me in lessons. At the age of 10, I got into piano lessons and it kind of gave me the musical foundation. When did your music career officially start? Matthew: I’ve been trying out different things to see what worked and it just so happened recently. I have been in many bands and toured with a bunch of different artists, and I would go to these shows and would get asked, “Where is your music?” and I would respond, “Well, I don’t have any.” One day it just kind made me realize that maybe I should do the whole artist thing. I did a band for a bit and it got some hype but that soon died out. I became a solo artist about a year and half ago, and that was the thing that finally clicked after years and years of trying the band thing. I had to deal with so many flaky band members that when I became a solo artist it just made everything simpler. What are some of the biggest challenges that you have to face as a solo artist? Matthew: Having to do everything myself (laughs). I have to do the booking, graphic design, video editing, photography, and build my own tracks. When it’s all you – it’s all you! There is no one else to blame. It literally all comes down to if I want to work then I have to get out there to hustle and network to make things happen. No one else is doing that for me. I understand that you just recently went on an international tour with the Falling Doves. Can you tell me about your experience touring overseas? Matthew: It was pretty amazing! Australia is absolutely stunning. The people are so genuine and nice. It was a culture shock but in a good way. I think a lot of people in San Diego and LA are spoiled with the amount of talent and incredible musicians. The people over there have never seen a certain type of show and they just love it! We were very appreciated over there. It was just an incredible time! Matthew Phillips performs at the Music Box. Photo by Elfego Becerra. What is your favorite music venue? Matthew: Music Box in San Diego. Their whole production team is absolutely amazing! The part owners Damon and Paige Barone are some of the nicest people you’ll ever meet. Their venue is absolutely beautiful! Music Box is one of the few places that has a 30 feet LED wall that you can utilize with visuals or if you want to keep it simple with just a picture of your band’s name. I can’t think of any other intimate venue that offers that perk. Do you use any background visuals at your shows? Matthew: Yes, I use a visual that syncs to the songs I’m playing on stage. It’s like an actual story line is happening behind me while the song is playing. How do you go about picking the footage and the graphics for your shows? Matthew: I kind of piece together random clips that I find on Youtube. With a particular song I will have clips or little tidbits that match what’s going on in the song. I do a lot of filming for my videos as well. I want certain parts of my set to feature live footage of me doing certain things on my guitar on screen. I have also done collaborations with artists like Elise Trouw. When I play the Goo Goo Dolls song, “Iris,” I pull a live footage from when me and Elise Trouw collaborated to put up on the screen. How do you sync the videos up with your music? Matthew: My band plays with a backing track and click track, basically I was able to set and drop the video perfectly in sync over the actual file that we play to. You can check out my edits on MatthewPhillipsMusic.com under the video tab. My most recent edit is the NAMM 2018 footage. Did you have any videography experience before becoming an artist? Matthew: All self taught. I had to learn a lot of things on my own back when I was in a band. My experience came from years and years of just trying to make things work. Do you have a basic story line in your head or is the magic in the editing? Matthew: It depends. Most of the time whoever is filming me I’m just like, “Dude, just document everything.” There are a lot of people on social media that like to fake things or create things, and I just want to document what I’m doing. We stick with that mindset. Actually, I was in a studio and I had a photographer that was trying to make things happen and I was like, “No, dude. You got to document what I’m doing. If you’re telling me to put my hands in certain places and act then we are creating things that aren’t really happening.” He had never worked in a studio environment before, so I just told him to document everything that happens naturally. Which of your videos are you the most proud of? Matthew: The NAMM 2018 one or the Kaaboo behind the scenes with my buddy Chris Ruel, who is my front of house engineer. The Kaaboo video was just a 1 minute blog post but it turned out real cool. I am real proud of that one! It did not take too long to edit. We were given so much awesome footage of this awesome festival, but it took about 5 hours to put together. The NAMM one was way more detailed that took about 10-15 hours to fully edit.